Doesnt overdo unit counts and under-engineer AI, unlike most East Front wargames. Wargame of the Year material. This game doesn't come with conventional AI. Buy it, and the Croatian devs mail you two giant, powder-filled jiffy-bags, one labelled 'Ferdinand Fuchs', the other 'Boris Bastardov'. Open these, add five gallons of vodka to the Boris bag and five gallons of schnapps to the Ferdinand, then stand back as two super-sly Ost Front generals materialise in front of you. OK, that isn't 100% true, but there are times playing this exceptionally ergonomic hex wargame when you do have to remind yourself that you're not up against a real-life Zhukov or Manstein. When you're blitzkrieging towards an objective and realise the enemy has just sidestepped your assault, nipped into your rear, and severed your supply line. When a row of pummelled foes pulls back to man more tenable positions. When Ferdinand pickaxes a neat hole in the weakest section of your front, then pumps Grossdeutschland supermen through the breach... at humbling moments like these, the years that have gone into this two-man indie effort really show. Unity isn't just smart, it's also flavoursome. There's an unmistakable Eastern Front tang to the 18 scenarios that make up the two campaigns. As the CO of Army Group South you'll have to learn to put up with partisan hassles, air superiority-negating blizzards, and fragile Romanian, Hungarian and Italian allies. Serving Stalin means accepting the innate inferiority of Ivan infantry corps. Whichever side you select, no advance is likely to commence without a long hard look at the supply map. The barrels that automatically radiate from controlled railways and supply hubs are the lifeblood that keeps Tiger tanks tigerish, Katyushas kataclysmic. Much of the time, generals aren't looking to smash enemy units in one fell swoop, they're out to encircle and suffocate them over two or three turns. Unity – like the 1942-43 operations that inspired it – is all about turning bulges into pockets, salients into corpse-strewn kessels. 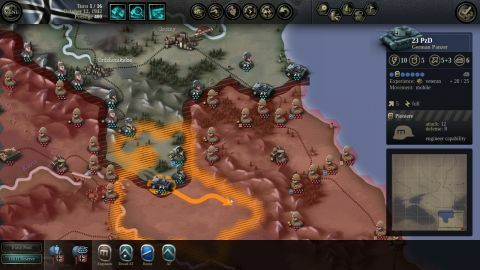 More in tune with its subjectmatter than recent peer Panzer Corps (PCG 231), the game has a similarly trim interface and old-fashioned approach to campaigning. Because 2x2 have plucked their pleasingly petite battles chronologically from history, early campaign episodes aren't necessarily easier than later ones. Continuity is provided by a simple victory points mechanism: winning quickly in early outings means more funds for reinforcements later. It works, but you may find yourself picturing the battle engine married to something bolder – a strat-map perhaps. Wherever this evocative engine heads next, discerning grogs are likely to follow it in droves. Wargames this fresh and friendly, featuring opponents as formidable as Ferdinand and Boris, tend to inspire deep loyalty.